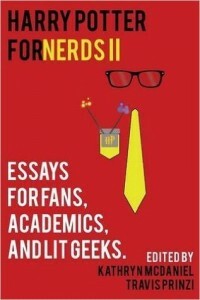 Today marks the official launch of Harry Potter for Nerds II! I'm pleased to say I have an essay in the collection, and so do five of my current and former graduate students. There's lots of news to share! * The Mugglenet Academia podcast has devoted its latest episode ("Lesson 37") to the book. Listen here. * Purchase Harry Potter for Nerds II by Halloween and you will receive free extras, including a recorded discussion featuring Yours Truly and the book's co-editor, my dear friend Dr. Kathryn N. McDaniel. Go here for more information. * You also can enter a Goodreads giveaway here for a chance to win a free copy. Please share the news! how awesome! Will certainly share the gladsome news. Congratulations! Big congrats! And slightly smaller cong-voles!